Scientists at the United State’s National Ignition Facility (NIF) are currently working on unlocking the key to nuclear fusion power by zapping atoms with giant lasers – and the project just got a major show of support from companies and laboratories the UK. The Rutherford Appleton Lab and the british company AWE have announced that they will join forces with the US to make this sustainable energy source a reality. For those of us who need a science class refresher, nuclear fusion and fission are very different things. The nuclear plants that operate today use fission, the splitting of heavy atoms to create energy. 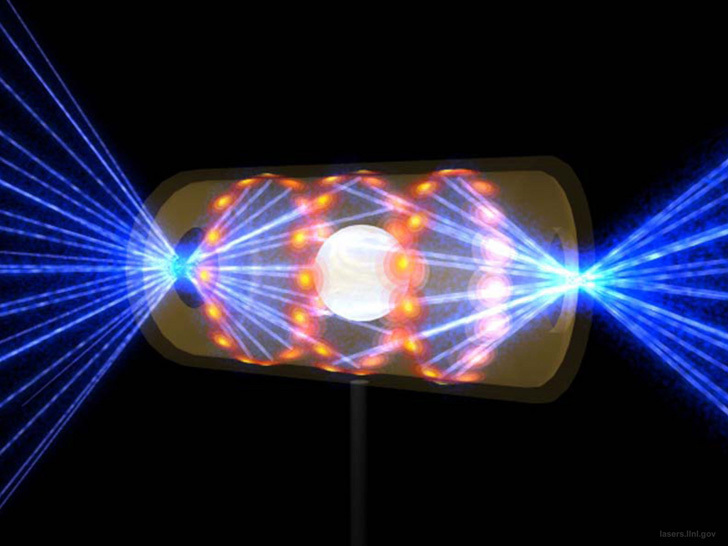 Nuclear fusion is the slamming together of two light atoms to create much more energy. Think about the energy produced by an atomic bomb versus the energy produced by the sun. In a meeting this week sponsored by the Institute of Physics, the Rutherford Appleton Lab announced their collaborative experiments with NIF’s lasers, which happen to include the largest one in the world. Scientists essentially fire hundreds of lasers at tiny pellets of hydrogen to compress the atoms. The energy, in the form of heat, can be captured and used. Fusion technology has been in the works for many years. However its one fatal flaw is that no fusion reactor has been able to produce more energy than it consumes. The recent experiment finally did, for a tiny fraction of a second. If and when this technology is perfected (which scientists are now predicting will be a matter of a few years), the US and the UK will be at the forefront of alternative energy, creating miniature stars on earth. Scientists at the United State's National Ignition Facility (NIF) are currently working on unlocking the key to nuclear fusion power by zapping atoms with giant lasers - and the project just got a major show of support from companies and laboratories the UK. The Rutherford Appleton Lab and the british company AWE have announced that they will join forces with the US to make this sustainable energy source a reality.